The first route between Barrie and Penetanguishene will launch August 7, 2018. Another notable change is the addition of weekend service on Route 800, between 8am and 6pm. Additional service changes have been posted: Route 11 - slight schedule modifications	Route 501 - increased service from every 10 to every 8 minutes, weekday PM peak only	Route 502 - increased service from every 10 to every 5 minutes going from Cataraqui Centre to Downtown (via Bayridge/Front), weekday AM peak only. This change was actually made in the Fall as a temporary measure to reduce overcrowding, but has now been made a permanent change. Route 701/702 - schedule modifications, with buses now leaving Cataraqui Centre at :15/:45 as opposed to :10/:40. YRT Service Change effective April 29 https://www.yrt.ca/en/schedules-and-maps/service-changes.aspx Most changes are just widening of frequencies by ~5 minutes (for reliability purposes, probably). Few things to note however: 16 16th Avenue - Saturday service decreased from every 25 to every 37 minutes, Sunday service decreased from every 31 to every 47 minutes	20 Jane - will NOT have its frequency boosted for the Wonderland season this year. Instead, 760 Vaughan Mills/Wonderland will run every 24 minutes, every day of the week. Routes serving York University will exit campus using Ian MacDonald / Northwest Gate to Pioneer Village Terminal, as opposed to Founders / Steeles. 104 Derry Express will start service April 30. Service will run every 16 minutes, weekday AM/PM peak only. 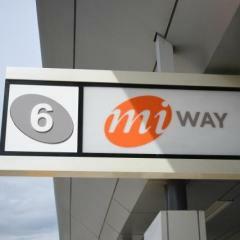 https://www7.mississauga.ca/Documents/miway/routemaps/20180430_NAV_104.pdf Stop locations: Meadowvale Town Centre	Argentia	Financial at Syntex/6897 Financial	Mavis	McLaughlin	Hurontario	Kennedy	Tomken	Columbus/Cardiff	Dixie	Bramalea	Cattrick/Torbram	Airport Road	Goreway	Westwood Square	Proposed route changes to 38, 42, 57 and 61 seems to have been postponed for future service changes. Don't tap at Union when transferring between Trains, just tap off at your final destination. Brampton Transit Proposed 2018 Changes http://www.brampton.ca/EN/residents/transit/service-alerts/Documents/BramptonTransit_PICBoards_Feb2018_Web.pdf Züm along Airport Road will operated between Bovaird/Airport and Malton GO in 2018 and Viscount Station in 2020.